*European release. Contains 1 bonus track & 11 tracks total. The '80s officially ended on January 1, 1990, but for metal and hard rock fans, the early ‘90s felt a lot like the '‘80s -- that is, until Nirvana's Nevermind and Pearl Jam's 10 (both 1991 releases) made grunge explode commercially, and caused alternative rock to become rock's primary direction. After that, bands playing ''80s-style metal or '80s-style hard rock sounded very dated. But for some metalheads, the '80s never ended -- and Dominator is a 2008/2009 recording that finds former Accept frontman Udo Dirkschneider continuing to party like it's 1985. Like many other albums that Dirkschneider and his band U.D.O. have recorded in a post-Nevermind, post-10 world, Dominator finds the veteran headbanger stubbornly clinging to '80s-style power metal. But the fact that Dominator sounds so dated by late-2000s standards is not necessarily a bad thing -- certainly not if one still has a passionate craving for pre-''90s metal. "Heavy Metal Heaven," "Stillness of Time," and other fist-pumping tracks don't break any new ground for Dirkschneider, but they're solid and inspired nonetheless. After all these years, he still belts out old-school power metal with plenty of conviction -- and he never sounds the least bit bored on this 44-minute CD. If Dirkschneider had grown bored with this type of material, it would show. But that isn't the case at all. His passion and intensity remain. So his refusal to change with the times is probably for the best. 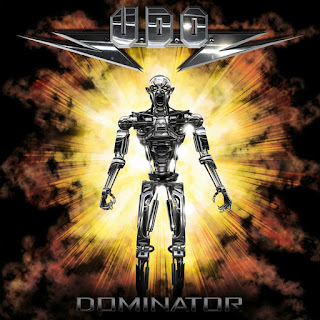 Bottom line: headbangers who still treasure the albums that Accept, Judas Priest, and AC/DC recorded in the ‘80s will find that Dominator, although not essential, is a worthwhile, if predictable, addition to U.D.O. 's catalog.